e.g. Street, City, State ZIP Code, etc. Who is the patient?The patient is the individual seeking to have their own medical records released. THIS MEDICAL RECORDS RELEASE (the "Release") is made April 19, 2019. Digital recordings, including but not limited to digital images. 1.2 All information related to the accounting of the Patient’s files, including but without limitation to Statements of Account. 1.3 All other authorizations previously received for the release of any or all of the Patient’s medical information. 1.4 All of the above is collectively referred to as “Medical Records”, as represented on paper, kept in folders, orstored digitally, electronically, or any other form. 1.5 "Medical Records" also includes production of any documents or material by physicians, nurses, chiropractors, dentists, therapists, counselors, consultants, technicians, and any and all staff of the organization to which this Release is directed. 2. I ask that the Patient’s Medical Records be released to me, for my own personal use. 2.2 I am aware of the potential for information disclosed pursuant to this Release to be subject to redisclosure by me and so may no longer be protected. 3. I ask that the Patient's Medical Records be released within the next 30 days as required by the Health Insurance Portability and Accountability Act. 5. This Release will be valid until the earlier of when you receive written notice from me revoking this Release, or April 19, 2019. 6. This Release does not affect any ongoing or future care of the Patient. What is a Medical Records Release Form? A Medical Records Release Form is a document used by an individual (or their representative) to release personal medical records to another party. What information is included in a Medical Records Release Form? If there are any errors in the records, individuals can also include details about the errors (such as where the errors are located) and the corrections. Who are the parties in a Medical Records Release? The patient. The patient is the person whose medical records are being released to another party; this is often the person who received or is receiving some type of medical treatment in relation to the records that are to be released. The guardian. A guardian (or legal representative) is only involved when the records relate to a minor or a dependent adult (such as an adult who has mental disabilities). Minors and dependents cannot authorize their own medical release, so a guardian is required to do so on their behalf. The organization holding the records. This is where the records are currently being held. This could be any type of medical facility, such as a hospital, clinic, doctor's office, massage therapist, etc. The organization or individual that requires access. In some instances, medical records need to be shared with organizations or individuals such as lawyers, insurance companies, or employers. For example, if you were injured in a motor vehicle accident and required physiotherapy, your physiotherapist may be required to provide your lawyer or insurance company with information about your injury and would require a Medical Records Release Form to do so. Why do I need a Medical Records Release Form? The Health Information Portability and Accountability Act (HIPAA) has rules in place to protect health information from being improperly used or disclosed. When someone requests access to your medical records, HIPAA requires that they obtain your consent. Using a Medical Records Release Form helps prevent the release of medical records to unauthorized parties and helps keep your information confidential. How long are Medical Records Release Forms good for? When creating your Medical Records Release, you can set an end date that will invalidate the consent form once that date has passed. A Medical Records Release Form can remain valid for years or even decades; however, it is highly recommended that you limit the validity of your Medical Records Release Form to two years or less in order to help prevent unauthorized disclosure of your medical records. 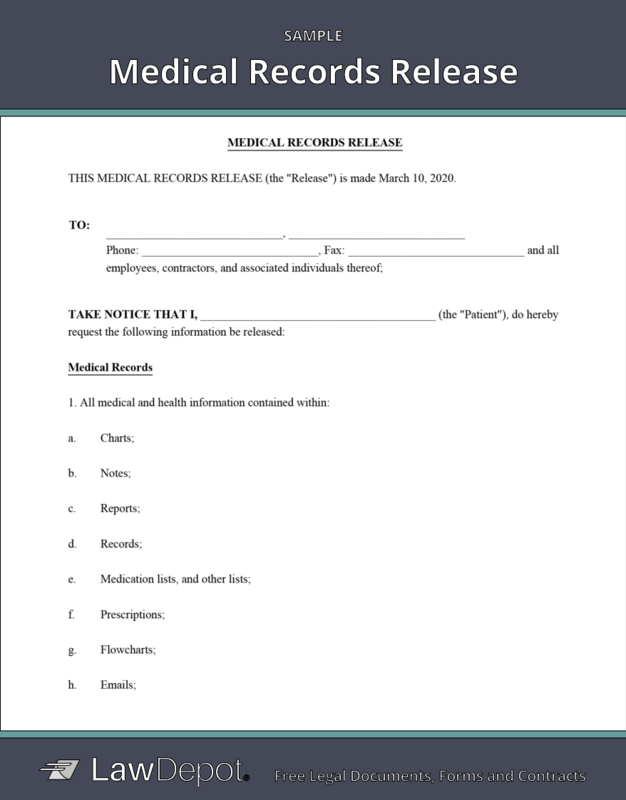 Personalize your Medical Records Release template.